CUT DOWN ON F.E.E.S! That was the Environment Department’s call to all resort staff during the launch of Pa-Berdehan: The El Nido Resorts Eco- Challenge 2012 last September 15 and 22, 2012 at Miniloc and Apulit Island Resorts. With rising global temperatures and the declaration of 2012 as the International Year of Sustainable Energy for All, this year’s theme aims to turn down the heat through the reduction of all or any of the following: Fuel, Electricity, Effort or Scrap (F.E.E.S.). All departments were encouraged to submit a project for implementation at the resorts. The projects will be judged by the Management Committee based on Reproducibility (20%), Creativity and Originality (20%), Environmental Impact (20%) and F.E.E.S. Reduction (40%). The winning entry will be announced on December and receive a cash prize of PhP10,000. Pa-Berdehan is a company-wide competition for environmentally friendly initiatives held annually to encourage staff to apply what they learned from the Be GREEN (Guard, Respect, Educate El Nido) training program. Last year, the Miniloc Food and Beverage department took home the top prize for their three-part project: serving homemade organic tea instead of using tea bags, serving fresh buko pandan juice instead of concentrated Four Seasons juice as the welcome drink, and turning the waterproof cloth of old umbrellas into reusable bags for keeping plates and cutlery dry. 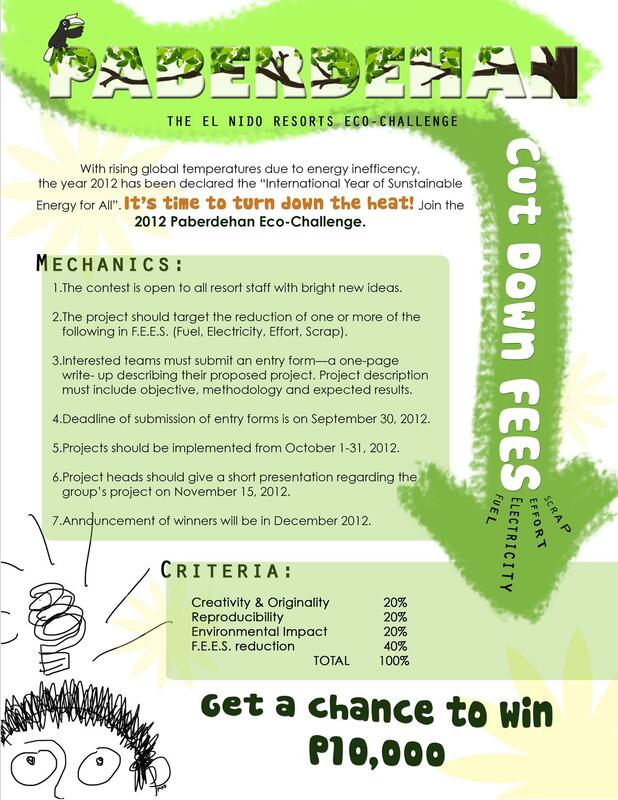 Deadline for submission of entries was extended to October 10!